Find duplicates and merge them to maintain a clean database. Let's see when and how to use these De-duplication tools in Zoho CRM. 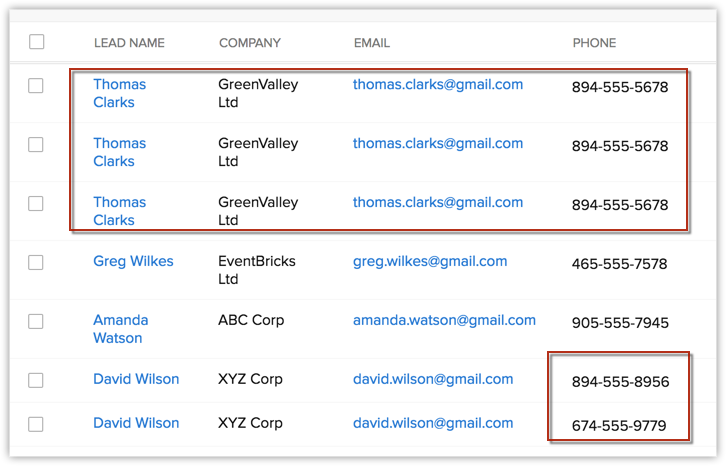 Sometimes, you might be aware that specific records carry duplicate entries in your Zoho CRM account. 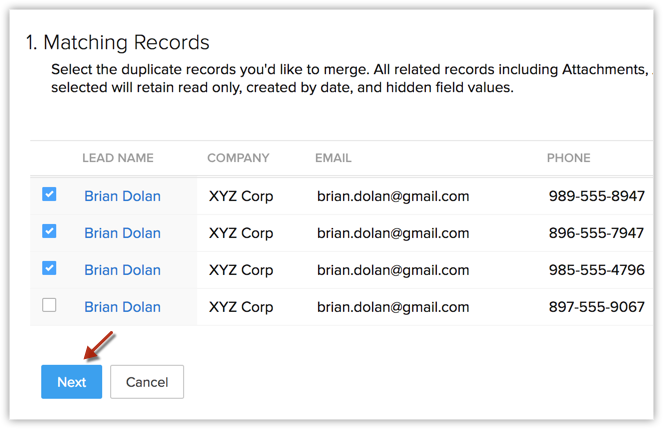 In such cases, when you know which records have duplicates, you can simply go to the Detail page of this record, and use Find and Merge Duplicate to fetch its duplicates. For example, you know that a lead called "Brian Dolan" has been duplicated and you want to find and merge them all into one record. In this case simply go to the Leads module and click Brian Dolan. In the Detail page of Brian Dolan, click the More icon and select Find and Merge Duplicates. Follow the required steps and merge the multiple records into one Master Record. This tool comes handy when you simply doubt that your CRM account carries duplicates, however you don't know which ones. You can let Zoho CRM run an overall check on each module using the De-duplicate tool. Let's look at an example. Simply go to the Leads module, click on the More icon and select De-duplicate. Select fields based on which you wish to run a duplication check. For example, you can select Company Name and Email address. 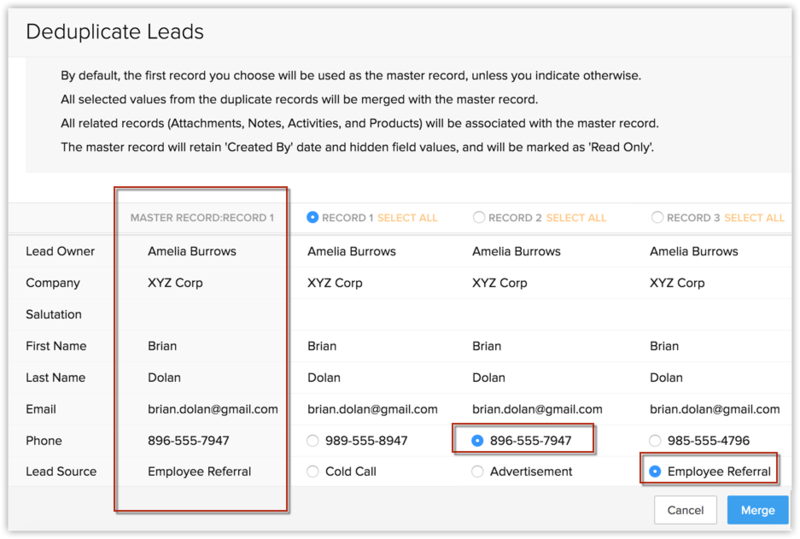 Zoho CRM will search for all the records in the Leads module in which the Email and Company fields' values are same. CRM will automatically find and merge the exact matches. In case of conflicts in field values, you must manually resolve the conflicts and merge records. For example, as you can see in the image, the email thomas.clark@gmail.com has three exact matches. The system will auto-merge these three records. However, there are two records for david.wilson@gmail.com with two different phone numbers. In such cases, you will have to resolve the conflict by choosing which phone number should be retained. Once you resolve the conflict, the two records will be merged as one. Voila! Your system is now free of duplicates.